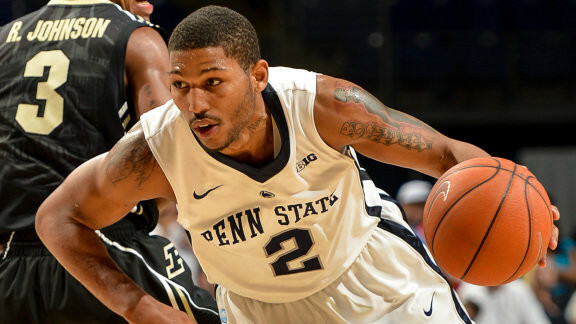 North Philly’s Devonte “D Jay” Newbill is one of the most talented college basketball players in the country. His trek to the top of the college basketball world has been filled with potholes and detours. Through it all, D Jay remained composed and focused on his long term objectives. Make no mistake, D Jay was “big time.” The 6-4 senior guard was committed to the Big East Conference’s Marquette Golden Eagles. “We’ve seen kids at the highest level before…. This kid’s going to be a hell of a player,” Kostelac continued. “The way he plays fits into that Marquette system. Looking back, we have to give Coach Kostelac his due. He was dead on in his assessment. D Jay Newbill is a “hell of a player.” He plays at the the high major level. But, he never made it to Marquette University and the Big East Conference. After committing to his “dream school,” he signed a National Letter of Intent in April 2010. He was supposed to begin at Marquette on July 7th. D Jay never set foot on campus. Marquette Head Coach Buzz Williams fucked the kid over. Publicly, Williams said, “Through a culmination of several things, we have decided to give DJ Newbill his release. DJ’s a great kid. He comes from a great family whom we have established relationships with, and we’re going to do everything we can to help him in his future, in whatever capacity that would be.” Within days of dropping Newbill, Marquette announced they signed Jamil Wilson, a local Wisconsin player who transferred home from Oregon. Plainly stated, Buzz cut D Jay to make room for a former Top 100 Wisconsin player coming home. Even though he never made it to Marquette, signing D Jay was a smart move by Buzz Williams. Once D Jay signed, he could never land at another Big East school. Strategically, Buzz cut off the possibility of D Jay attending West Virginia, Georgetown, St. John’s or any school in his league. Interestingly, then Georgetown Assistant, and current American Head, Coach Mike Brennan and West Virginia Head Coach Bobby Huggins had just watched Newbill in person before he committed to Marquette. By accepting the National Letter of Intent from Newbill, Buzz effectively eliminated the possibility of facing D Jay in the Big East Conference. After the shrewd, but heartless, move by Buzz Williams, Newbill was permanently banned from playing for another Big East team. Indeed, Newbill was left scrambling. His dream of wearing the Marquette uniform and playing in the Big East tournament was shattered in an instant. Through no fault of his own, he was once again looking for a scholarship. The only difference was the Big East Conference was no longer an option. Referring to the decision to release him, Newbill said. “I was mad and hurt when this first happened. Now I’ll just go forth with my career somewhere else. Back to the drawing board. I’ll have to be careful about what school I pick.” In what would become a recurring theme, Newbill learned from facing difficult and adverse circumstances. There was still considerable demand for Newbill as college prospect, but it was very late in the recruiting season. As a senior he led Strawberry Mansion, coached by Stan Laws, to the 2010 PIAA state championship game at Penn State’s Bryce Jordan Center. D Jay was named the Pennsylvania Class AA Player-of-the-Year after posting 24.2 points, 9.0 rebounds, 5.0 assists and 4.0 steals per game as a senior. He was a first-team all-state selection by the Philadelphia Daily News. 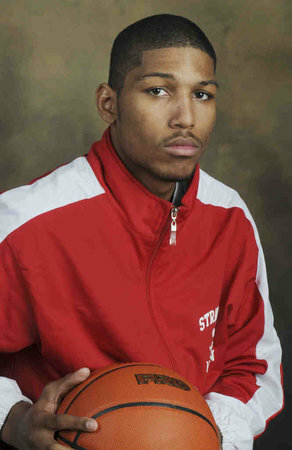 He was also named the Public League Player-of-the-Year and first-team all-city and All-Public League. 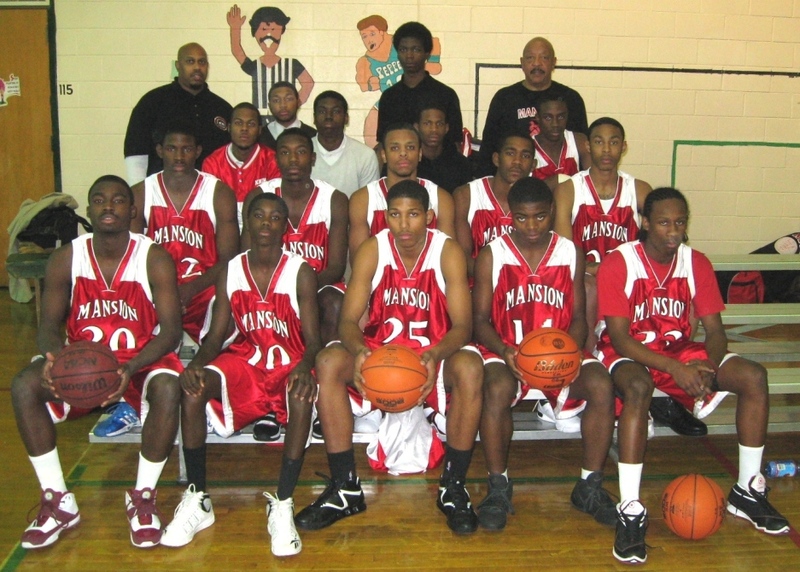 Mansion posted a 28-2 record during his senior year which was highlighted by a school-record 64-point performance in a victory over Saul, the sixth-highest point total in Philadelphia Public League history. As a junior D Jay averaged 19.0 points, 7.0 rebounds, 4.0 assists and 3.0 steals as a junior and was named second-team all-state and second-team All-Public League. There was no doubt that Newbill could play, the question was: Where would he play? 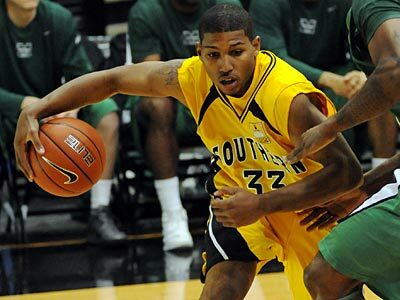 Newbill considered hometown programs such as Drexel, La Salle, Saint Joseph’s and Temple but he eventually settled at Southern Mississippi. After being without a scholarship as late as July, Newbill had a wonderful freshman season, He averaged nearly 10 ppg and 6.2 rpg for the Golden Eagles as a 6’4″, 205 lb guard. Despite joining the program very late in the recruiting season, D Jay started all 32 games and played over 30 mpg. Despite his early success, attending college in Hattiesburg, Mississippi, was not exactly appealing to D Jay. Newbill truly never felt at home in Mississippi. After being deceived and mistreated by Buzz Williams and spending a year in the deep South, Newbill was longing for a place he could truly call “home.” His longing for Pennsylvania became especially intense after his first college basketball season ended. Fortunately, he was given an opportunity to come North and to return to his home state of Pennsylvania. Pat Chambers offered D Jay an opportunity to attend Penn State University and play in the super competitive Big Ten Conference. Newbill would be Chambers’ first major recruit in Happy Valley. As a high school student, Newbill chose Marquette because that was his dream school and he chose Southern Mississippi because they had spot for him in late July. As a young man, he chose Penn State because it was the best possible academic and athletic situation for him. After committing, he said, “I chose Penn State because of family atmosphere, academics and the Big Ten Conference… [I’ll get] a lot of exposure… Penn State is not too far. I can come home and then get away when I want to focus on me.” It was a great decision, a true win-win situation. D Jay Newbill is, in many ways, a throwback. His demeanor and his game reflect the influence of Philadelphia’s great basketball tradition. He is part of a distinct Philadelphia lineage. D Jay is a “Hardnett” kid. In Philadelphia, that immediately identifies a basketball player as patient, smart, skilled and well schooled in the fundamental aspects of basketball. Hardnett kids also exhibit positive social skills. Hardnett kids went to class and put forth an honest effort with the books. But it was the way they played the game of basketball that drew most to Hardnett kids. The late John Hardnett, one of Coach Chaney’s disciples ran basketball workouts and fielded teams in the historic Sonny Hill Summer League program. John Hardnett kids play a distinctly cerebral brand of basketball. Hardnett died suddenly in May 2010. Newbill was one of the last of many great high school and college players developed by Hardnett. 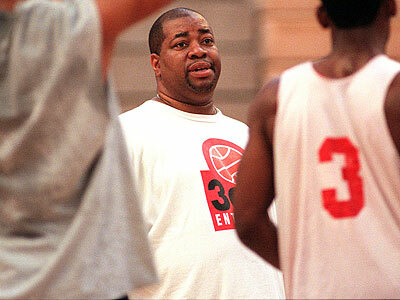 Doug Overton, Aaron McKie, Alvin Williams, Marc Jackson, Jamal Nichols, Mark Tyndale, Mardy Collins, Scott Rodgers, Dionte Christmas, Samme Givens, Ellis Gindraw and many other Philly ballers were schooled by Hardnett. Penn State hired a Philly guy to coach the Men’s Basketball team and the first thing he did was sign a Hardnett kid. That was a sound decision, by all accounts a very good move. Since Chambers and Newbill have joined forces, the Penn State basketball program has improved and PSU has a bona fide star in the best basketball conference in the nation. But, most importantly, D Jay Newbill has finally found a “home.” He has embraced Penn State and feels a special connection with the student body and the Penn State community. Newbill would lean heavily on his Penn State family before he ever played a game in the Nittany Lion uniform. On September 15, 2012, his mother, Tawanda Roach, died suddenly. She had been diagnosed with cancer just three weeks earlier. For the second time in two years, Newbill experienced the excruciating pain of losing a loved one. He was particularly distraught after his mother’s death. He explained, “I just snapped out after that. I was throwing stuff around my room and I just broke down…I don’t think it can get any worse than that.” At 20, D Jay had endured a tremendous amount of adversity. The coach of his dream school “dropped him,” his mentor died suddenly and then he lost his mother. These were very tough times. D Jay credits Penn State for supporting him through this time in his life. With the full support of Penn State and the athletic department, D Jay was able to summon the inner strength and fortitude to continue pursuit of his academic and athletic goals. He said at the time, “I think these obstacles help shape me into the man that I going to become.” On the court, his play was inspired from the start. After sitting out the 2011-12 season in compliance with the transfer rule, Newbill exploded onto the Big 10 scene. This despite being forced to play point-guard after an early season injury to Tim Frazier. D Jay led Penn State in scoring (16.3) and assists (4.0) and was second in rebounding (5.0) and steals (1.2). He ranked ranked fourth in the Big Ten in scoring (16.4) and assists (4.1) in conference games. D Jay became the 17th Lion to score 500 points (504) in a season. He finished second in the Big Ten in minutes played (36.5) and third in free throw attempts (196) and 20-point games (10) in the regular season, including six 20-point games in Big Ten games. All he did the following season was get better in every category. D Jay finished second in the Big Ten scoring race to Nebraska’s Terran Petteway (18.0) at 17.8 points per game. He scored 20 or more in 10 of Penn State’s 31 contests. He led PSU in scoring on 15 occasions. Newbill led the team in field goal percentage at .466, averaged 4.9 rebounds and 1.7 assists per contest. Last season, Newbill led the Big Ten in total points (552) and field goals made (192). How much better was he? From year one in the Blue and White to year two, Newbill’s shooting percentage increased by five percentage points (41 to 46 percent). His three-point shooting percentage increased by eight percentage points (27 to 35 percent). Newbill also made a seven-percentage point increase at the foul line from last season to this year (68 to 75 percent). Academically, D Jay has been a strong student at PSU. He was only 6 credits shy of a Bachelor’s degree after the Spring semester ended. Coming off a strong season, he could have graduated and turned professional. How would he have fared? He would have been considered a potential second round NBA draft selection. Perhaps, he could have made a team as an undrafted free agent. He could also secured a fairly decent position in one of the more highly regarded European Leagues. Or, he could have ended up in the NBDL for a year. Who knows? 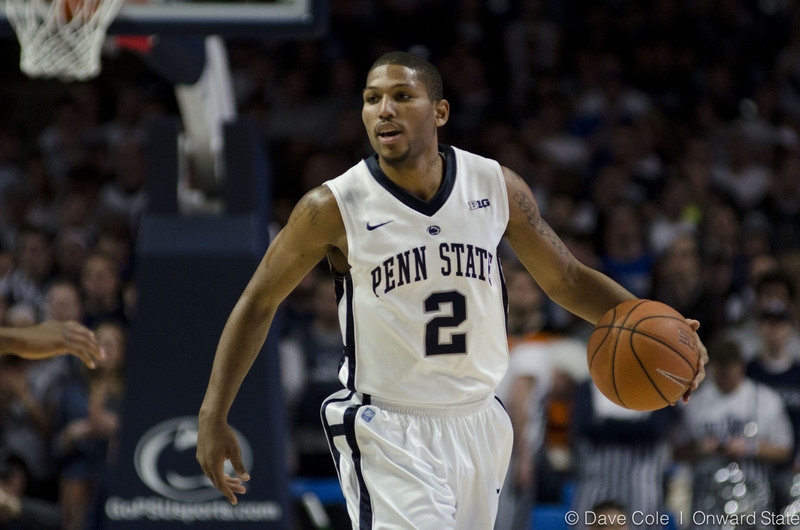 The important point is that because of his focus on academic as well as athletic goals, D Jay Newbill, after four years of college could have graduated from Penn State and began a professional basketball career. But turning pro wasn’t his only option. D Jay had several others avenues . The 5th year transfer rule would have allowed D Jay to graduate and ‘transfer’ to another program and retain immediate eligibility to play at the new school. This is an increasingly widespread strategy. As an All Big Ten performer D Jay would have been an attractive 5th year addition to many of the Top 20 programs in the nation. This fact wasn’t lost on D Jay’s friends and supporters. There were many suggestions offered. D Jay, however, took a different view. He found that he viewed the situation from the perspective of a Nittany Lion. D Jay is cognizant of his ongoing journey from North Philly to Penn State graduate and NBA prospect. His high school was featured on ABC’s flagship news program, “World News with Diane Sawyer,” in a special report on the state of education inside one of Philadelphia’s toughest schools to learn. At Strawberry Mansion, the average SAT Critical Reading score is 348 the average SAT Math score is 326. The average M/V combined score is 674. D Jay went through an adjustment period upon arriving at Penn State University where the average SAT scores fall between: Verbal: 530 and 630 and Math: 560 and 670. The average combined score is between 1090 and 1300. D Jay realized that he had to dedicate himself to his studies and work closely with the academic support staff for student-athletes. Looking at his career trend, Newbill increases his point total significantly every year. He scored 293 year 1, 504 in year 2 and 604 in year 3. Let’s conservatively assume he scores another 604. Newbill will have over 2,000 points and be likely be named All Big Ten for the second year in a row. But, more than any personal goal, Newbill wants to lead Penn State to the NCAA tournament. “The decision to attend Penn State was the best decision I have ever made. I’m a Nittany Lion for life! More than anything else I want help other people from around my way gain access to Penn State.” Newbill understands that the best way he can achieve that goal is by excelling as a professional basketball player.